The sumac chicken was tasty, but I cooked it in the middle of the week, so we could not finish it. 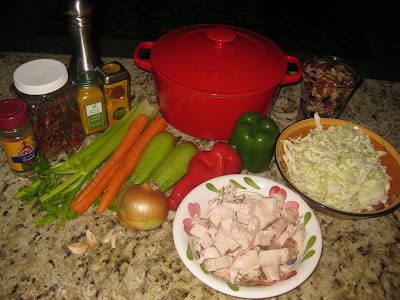 I like using leftover chicken for stews or salads, especially when the chicken is roasted. The dish cooks faster and the chicken adds another layer of flavour, that is hard to accomplish if you start with raw meat. The two beautifully roasted chicken breasts, nobody cared to have, were perfect for my spicy stew. A friend of mine cooked the stew for me few years ago, and I' ve been cooking it quite often since then. It is a very healthy and delicious meal. 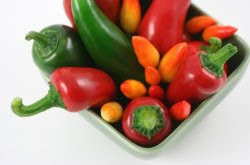 You can use whatever vegetables you have available, and play with different spices as well. My friend was recommending using exactly seven vegetables. Wash and chop your veggies. Try to make them equally sized. Start with sauteing the onions and the garlic. I usually add the salt and the rest of the spices to the onions, so I can extract most of the flavour. 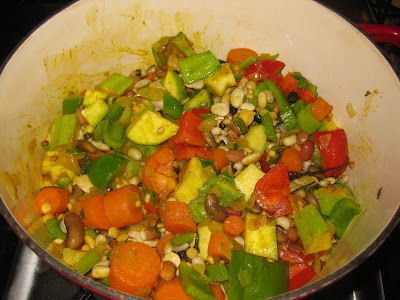 Then I add the carrots, the celery, the beans, the cabbage, the peppers, in order depending on the time required to cook. Add two cups of water and reduce the heat. When the carrots become soft, add the chicken, the zucchini, and the potatoes. 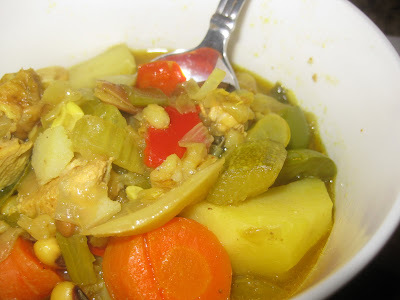 When the stew is ready, sprinkle with fresh parsley and serve the stew on top of couscous or quinoa. When I saw Plodova Salata's blueberry muffins this morning, I was...inspired and I wouldn't let the lack of eggs and milk prevent me from whipping up some good breakfast delights for SM. A quick glance in the fridge revealed that I still had some almond milk on hand. The egg-replacement issue was a little harder to fix. I recalled an article in the New York Times that discussed replacing eggs with ground flax seed in a cookie recipe. As far as I could recall, the experiment yielded some pretty good results. 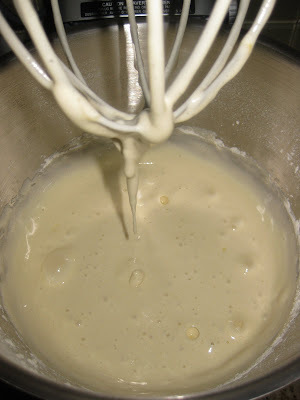 The consistency of the mixture was very thick (I think because of the banana addition...). Next time I need to add a bit more moisture or fat. The muffins were not sweet and definitely benefited from the confectioner's sugar. They paired very well with the sweet Lupicia Golden Honey Dew tea. The muffins were very light = they definitely exceeded my expectations! Curious about the nutritional info? 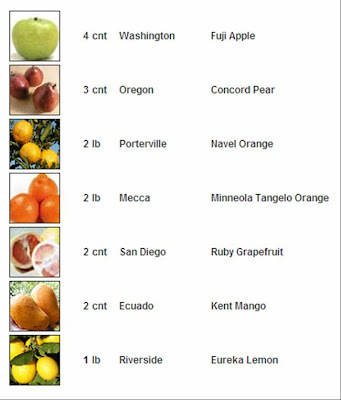 Take a look below - 3g of fiber!!! 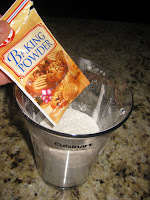 This is a recipe for muffins, but if you don't have the cups, use fluted baking pan. It's really simple to make, with less calories and ready to eat in 40 min. Heat oven to 400F. Grease bottom only of 12 muffin cups or baking pan. 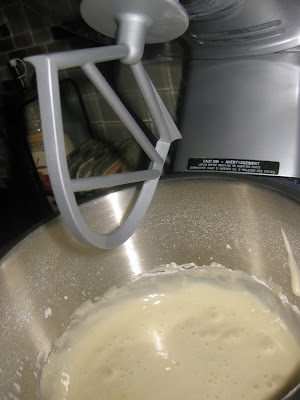 Beat milk, oil, vanilla and egg in a mixing bowl. 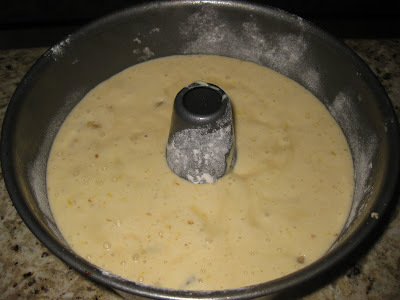 Stir in flour, sugar, baking powder and salt at once, just until flour is moistened (batter will be lumpy). Transfer the batter in the baking pan and put the blueberries on top of it. Stir batter gently around them until they are slightly covered. Bake for 20 -25 min, until golden brown. Dust with vanilla sugar, or just powdered sugar. Sumac is the wonderful spice, we taste on the Middle Eastern kebabs. It is extracted from the berries of a bush that grows wild in the Mediterranean region, especially southern Italy and parts of the Middle East. Often utilized in Arabic, Indian, and Lebanese cuisine as a rub on meats and kebabs, it can also be added to marinades, soups and stews, rice dishes, casseroles, salad dressings, dips, and many other dishes for additional elements of flavor. It can also simply be used on the table as a condiment to replace salt and pepper. Sumac has antimicrobial and antioxidant activity. The sumac spice was the inspiration for my roasted chicken. 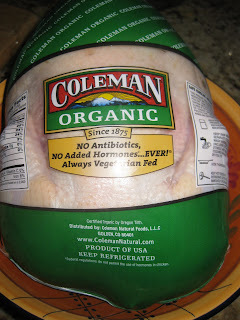 I used a whole, "hopefully" organic chicken, bought at Costco. STEP 1: Defrost, wash, and pat dry the chicken with paper towels. STEP 2: It is said that butterflying the chicken would allow more even and faster roasting. 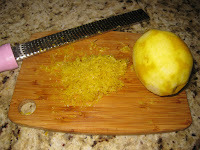 With the breast down, cut along each side of the backbone to remove it. STEP3: Flatten the breastbone. Use your hands or a meat ponder to achieve fairly even thickness. Tuck the wings behind the back. 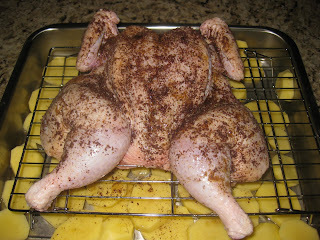 STEP 4: Rub the chicken with olive oil, salt, cumin, black pepper and sumac. STEP 5: Peel couple of potatoes and cut them in 1/3 inch thick slices. Spread the potatoes in an even layer in the roasting pan. Sprinkle lightly with salt and pour 1 cup water. 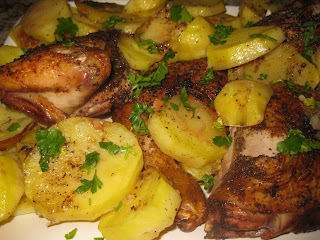 The juices and oil coming out of the chicken are enough to season the potatoes. STEP 6: Preheat the oven to 500F. Put the pan on a middle low positioned rack and bake for 45-50 minutes. 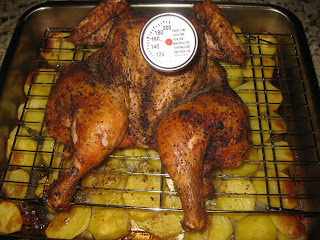 The temperature in the thickest part of the breast should be 160-165F and for the thighs should be 175F. The skin should be deep brown and crispy. 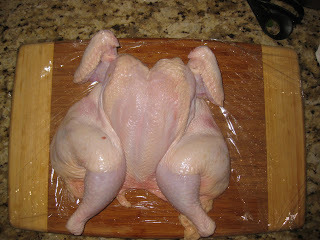 STEP 7: Transfer the chicken to a carving board and let it rest for 10 minutes. Carve the chicken and arrange on a plate with the roasted potatoes and sprikle with fresh parsley. The chicken was delightfully crisp and moist. 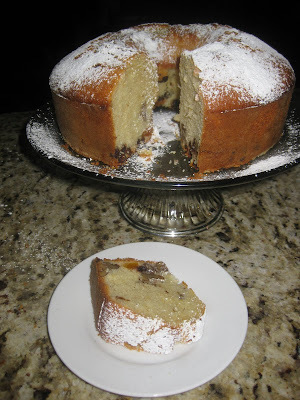 The sumac added a lemony, favorable tart and tangy flavor. P.S. Got an e-mail from Scratchunka Mimunka later in the day that the lunch was delicious! 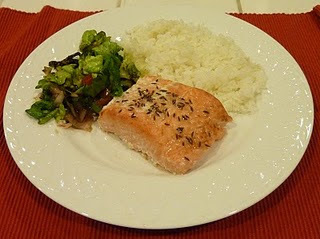 Our family favorite is ZK's barbecued salmon, but it's raining and it's cold outside, so this is my indoors alternative. Cut the fillet in uniform pieces, wash, tap dry with paper towels. Season with salt, olive oil and lemon juice from both sides. Arrange in a roasting pan , sprinkle the whole cumin and leave to rest at least for 30 min. before roasting. Preheat the oven to the max - mine is 450F, but 500 is even better. Put the pan in the oven and after 2-3 min. reduce the heat to 300 - 325F. Every oven is different, so you have to experiment. The idea is to seal the fillet at the beginning to preserve the juices. 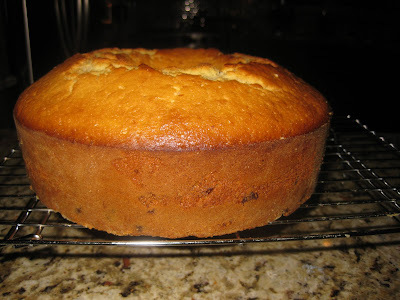 Bake for about 20 min, or until the inside temperature of the thickest part is 125F. Switch to "Broil" for 3-4- min. Enjoy with salad and easy Basmati rice on the side. ...at least as far as all the older ladies are concerned according to a brief article in the New York Times. Thoughts? Eating healthy with our insanely busy schedules and tempting high-calorie daily restaurant meal allowances can be quite difficult. Over the weekend, I try as much as I can to prepare for the week ahead. 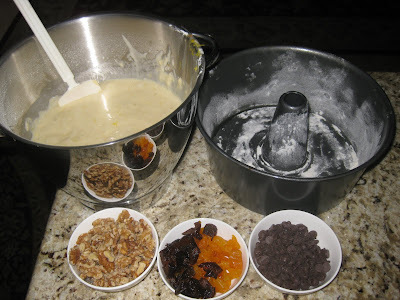 I cook batches of our diet staples, which include beans, whole grains, dairy products (and the occassional baking goods), which I refrigerate and use during the week. My objective is to make breakfast and dinner and pack healthy lunches during the week as often as possible. I will plan to report it all in this recurring weekly Sunday evening post. Spelt / kamut berry whole grain mix - I use it as a whole grain for breakfast, as a topping (kind of like cheese) on gratins, or when I want to add an interesting texture to soups, stews, salads, etc. I had some leek leftovers and wanted a soup! Something lite and warm. The recipes I checked called for much more leeks that I had, so I decided to add more veggies and see what will come out of it. Soup was very good! Put the olive oil and the butter in a pot. When heated, add the leeks, increase the heat and cook for about 8 min, stirring occasionally. Add the carrots, celery and bell pepper, and cook another 8-10 min. Add evenly cut potatoes, cook for 3-4 min, add salt, black pepper, dill, Cayenne (optional). Cover with hot water - about 6 cups. 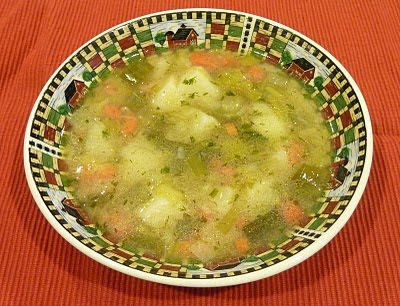 Reduce heat and cook until potatoes are soft - about 20 min. I use Zepter and when the thermometer riches the red zone I turn off the heat and live the soup for 1 hour. You can do the same with dutch oven, but the regular pot is just fine. 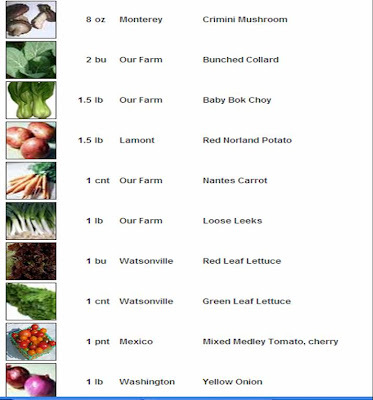 Next time I will make a cream soup out of this recipe and serve it with croutons.